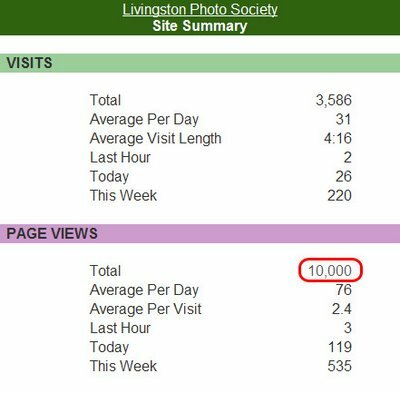 As you will see by the included screen capture from my site statistics software, today LivPhotSoc hit it's 10,000th page view. That's amazing, I had no idea it would get this far when I first started the site. I just wanted to thank everyone for their talent and contributions. On a side note, I will be adding a suggestion form to the right menu bar in the next few days and encourage everyone to use it. 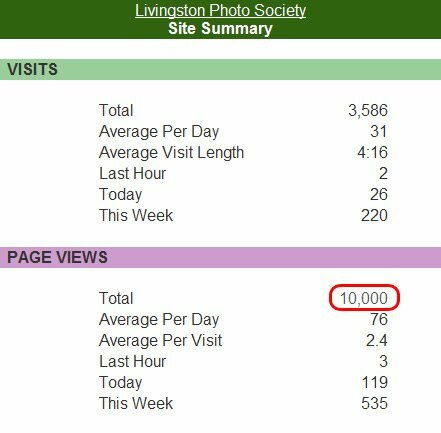 This is intended to get as much feedback as possible regarding the new layout for LivingstonPhotoSociety.com, which should be live sometime in mid-June. Please take a few minutes to help make our next home an even better one.